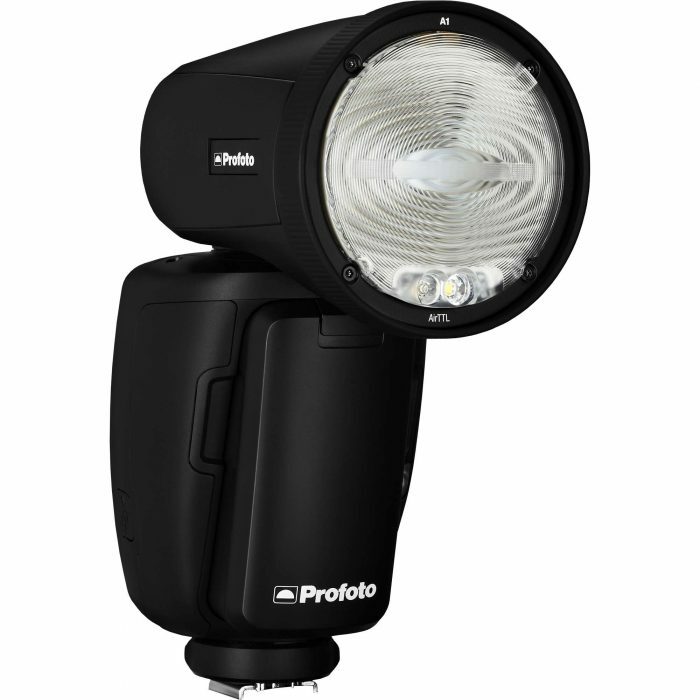 The Profoto A1 AirTTL-C Studio Light for Canon was created for the professional photographer looking for portability and performance features or the ambitious non-professional who recognizes quality lighting but wants it comfortably and easily without the hassle of an overly technical interface. The A1 is easy to use. You can literally take it out of the box and start shooting. Your first shot is nearly always a keeper. The old adage about not judging a book by its cover simply doesn’t apply here. The A1 is a good-looking flash, in fact, even its packaging could compete with Apple for design. Weighing 1.2 lb including its battery, the A1’s sleek matte black finish not only appeals to the eye but to the tactile sense as well. The first thing you’ll notice about the A1 is its 2.75″ round, tilting, rotating head which is the physical feature most responsible for the A1’s natural-looking light with its soft gradual fall-off. While we rarely use superlatives, we’ve heard the light quality described as “beautiful” and I’d have to agree. The auto-zoom built into the head handles focal lengths from 32 to 105mm and the included Wide Lens gives you wide-angle coverage from 14 – 24mm. You can override the auto-zoom function at any time and make your adjustments manually. A filter kit with graduated CTO conversion filters and a fluorescent filter is also available to modify the unit’s daylight color temperature. The A1 performs as well as it looks and feels. It recycles in 0.05 to 1.2 seconds – significantly faster than most flash units in its class and has action-stopping flash durations from 1/800 to 1/20,000 second. The A1 supports HSS (High Speed Sync) allowing you to shoot at shutter speeds as short a 1/8000 second instead of 1/250 to blur a distracting background using a wide aperture while controlling strong ambient light behind your subject. The 76Ws head has an LED modeling light that can give you a preview of how the light is falling on your subject. It can be turned on or off, set to automatically adjust proportionally to the power level selected or just switched to manual where it can be modified by hand. All adjustments are indicated on the exceptionally readable white on black LCD display The A1 is powered by an included Li-Ion battery that has a capacity of 350 full power flashes and thousands of partial power shots. Power is topped up on an exhausted battery in about 80 minutes with the included 100 – 240 VAC charger. The battery doesn’t fade as its power is used, operating at peak performance until it’s exhausted. Purchase of an additional battery is recommended. So far, we’ve been discussing the A1 used on-camera but when used off-camera it really earns its name as a “Studio Light.” The flash has a built-in transceiver that allows it to be used with other A1s, B2s or D2, B1 and B1X monolights. All the Air Remote wireless controllers can trigger the A1 at distances up to 1,000′ and the Air Sync will give you simple wireless triggering, while the Air Remote will let you wirelessly adjust power, grouping, channel selection and modeling light on/off. 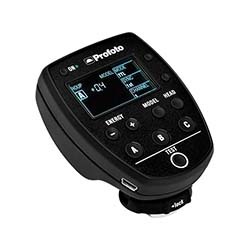 It’s the Air Remote TTL however, that allows you to explore and control the A1’s full capabilities. It wirelessly allows assignment of channels and groups as well as TTL and power level. In fact, the A1 has a switch that allows you to set your main light to TTL, switch to manual operation to adjust manual units in other groups to ratio their output, then switch back to TTL and return to the original TTL setting which was stored for you. The A1 also has +/-3 stops of exposure compensation that can be modified from the remote for your specific needs. The light also comes with a Bounce Card, 180-degree Dome Diffuser, Flash Stand and a nylon bag with shoulder strap for storage and transport. Flexible and easy to use, I think it’s safe to say that the A1 is a remarkable addition to Profoto’s roster. Is it an on-camera or an off-camera studio light? The fact is that it’s both and the choice of how to use is yours. This head is compatible with Profoto Air remotes, B1, B2 250, D2, and Pro 10 Pack.